a few weeks ago I rummaged around in my fabric box and stumbled upon a piece of old lace and wondered what I could do with it. I've had a few nice ideas (there is more to come ;) ) but for a start I decided to use a piece of it to create some nice-looking greetings cards. They were very easy to make and most probably you'll also have everything at home you'll need for them (apart from the lace maybe). Cut out a DIN A5 (148mm x 210mm) sized piece of paper and fold it into half. 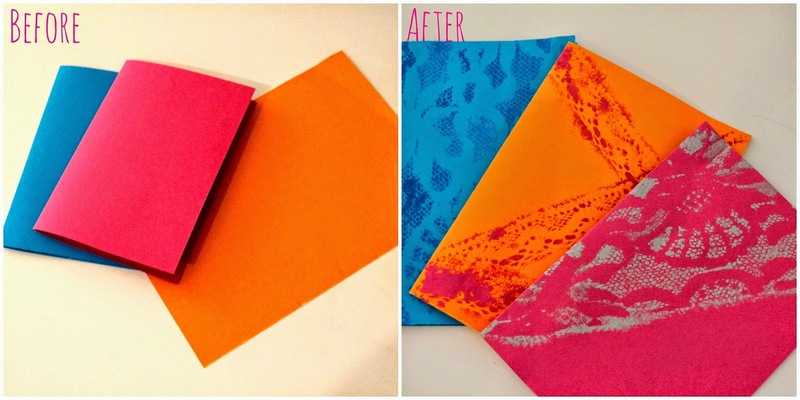 Take your piece of lace and wrap it around the card. Fixate it with paperclips. Dip the brush into the watercolour paint of your choice and dap it on the wrapped card. IMPORTANT: The colour should be as dry as possible, otherwise the pattern will become blurred. You can also only wrap half of the card or work with lace ribbon to create different kinds of pattern.